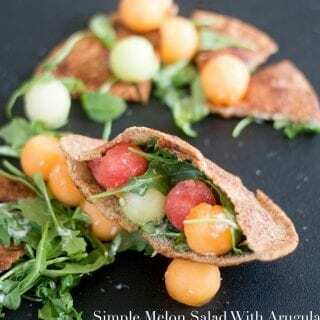 Arugula salad with melon balls topped with a tangy lemon dressing. Served on a bed of pita chips or serve in a cinnamon sugar pita pocket. When you have been handed a whole bunch of cantaloupes, watermelons and honeydew fruits, what is the most sensible thing to do? Dust of your melon baller and make melon balls with it? Well, I pulled out my melon baller and went to town on these melons! There are two ways to eat this arugula salad. First method is the fancy-schmancy way of eating it as seen in the photo below. 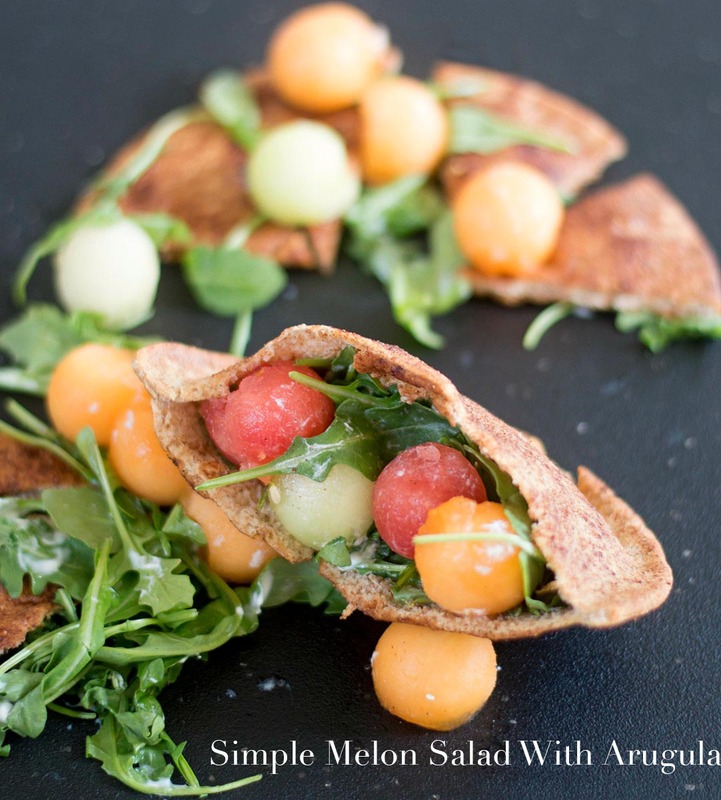 I put down my cinnamon sugar pita chips and topped it with arugula. Then, I added a few melons and drizzled it with a tangy yogurt vegan dressing. This is so perfect for an elegant brunch party you are throwing for very special people. The second way to serve it is in a pita pocket. This is no ordinary pita pocket. The outside of the pita pocket is coated with cinnamon and sugar before roasting in the oven for a few minutes. 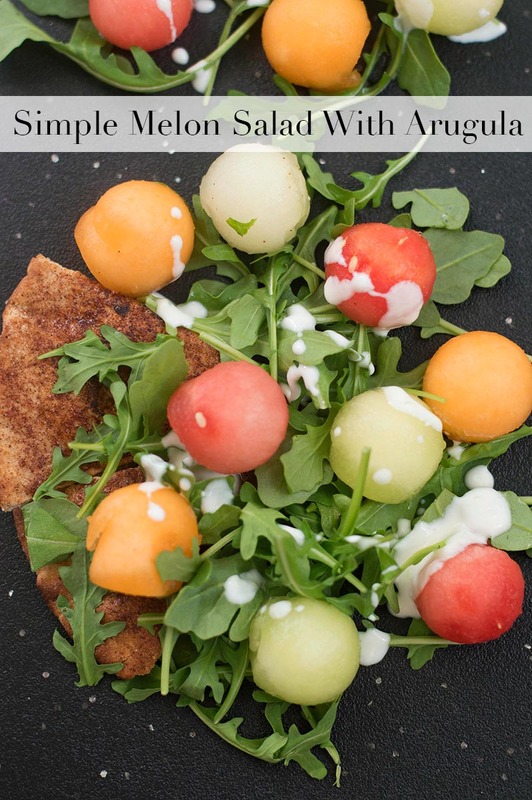 After they cool down, add a bed of arugula and top with a few melon balls. Drizzle with the same tangy yogurt dressing. 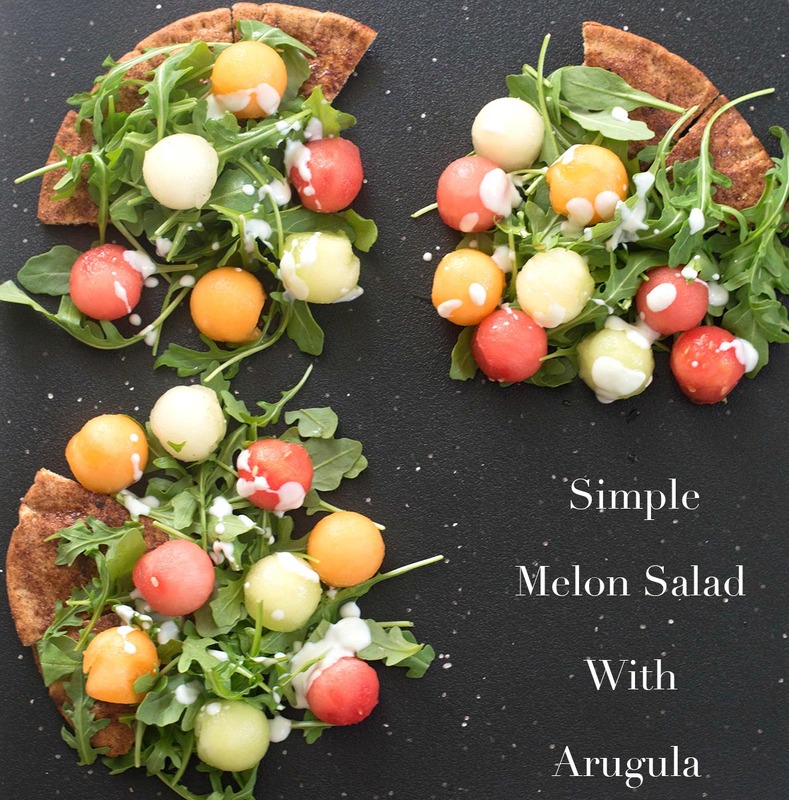 There are so many wonderful ways to use melons. My favorite cantaloupe recipe is the cantaloupe margarita. Watermelon is very popular in my home. This delicious watermelon salad with goat cheese is a perennial favorite. Watermelon curry is a fan favorite and it is very near and dear to my heart. This is the first time I have used honeydew on my blog and I can’t imagine not using them in the future. If you have arugula left over, you should turn it into a delicious arugula pesto recipe. What are some of your favorite cantaloupe recipes? Which is your favorite melon? 6) Butter the outsides of the halved pita. Mix 5 tsp of sugar and 2.5 tsp of cinnamon. Drizzle the sugar mixture on outsides of the halved pita. Open pita halves and generously butter the inside and outside of the pita. This looks so beautiful! Hmmm….would I eat it as a sandwich, dessert or salad? So many delicious options. The sauce sounds fabulous too – one big YUM for this recipe!! Thank you, Debra. I think it would work as both. I eat it for a brunch this Sunday and it was so perfect.